A dominant Antarctic ecological paradigm suggests that winter sea ice is generally the main feeding ground for krill larvae. Observations from our winter cruise to the southwest Atlantic sector of the Southern Ocean contradict this view and present the first evidence that the pack-ice zone is a food-poor habitat for larval development. 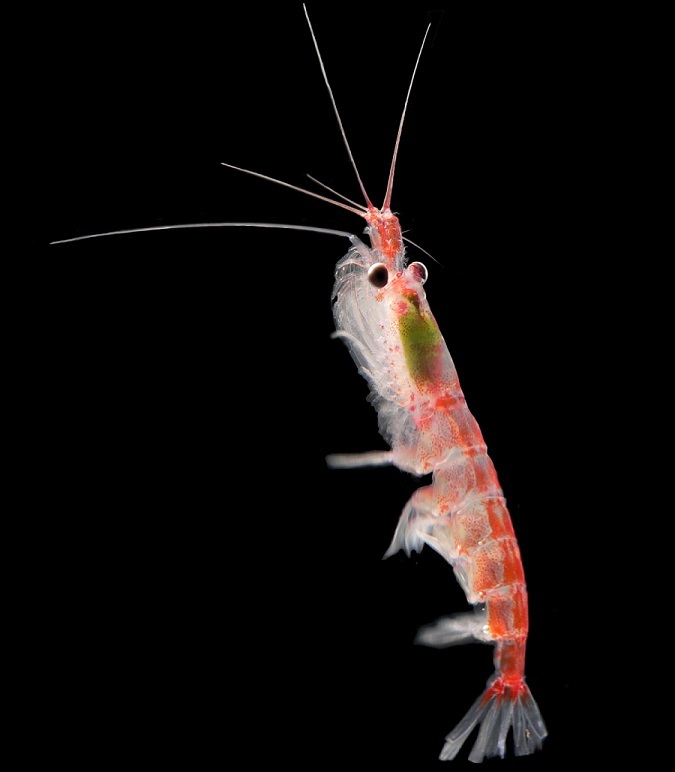 The finger-sized, shrimp-like crustacean, Euphausia superba or Antarctic krill, is the key link in the Southern Ocean food web (Fig.1). The abundance of krill in the Southern Ocean is estimated to be between 100 and 500 million tonnes. To put this amount into perspective, annually, less than 100 million tonnes of all species of fish and shellfish are currently harvested from the world’s oceans. Figure1: Antarctic krill, Euphausia superba, Photo credit: Carsten Pape. Antarctic krill plays a central role in the Southern Ocean food web, both as grazer of microscopic algae (mostly diatoms) and non-photosynthetic organisms (zooplankton) as well as prey for a wide range of Antarctic fish, birds and mammals. In addition, an important role for krill in biogeochemical cycles such as carbon export and iron recycling has been identified. The main spawning and nursery areas of krill are located in the southwest Atlantic sector of the Southern Ocean, which contains over 50 % of Southern Ocean’s krill stocks and is one of the fastest warming areas on our planet. Despite almost 100 years of krill research, a mechanistic understanding of how krill respond to environmental changes is still lacking. The main reason is that krill research was for many years driven by commercial interests with a focus on studying abundance and distribution patterns in order to get a more accurate quantitative estimate of krill biomass. Interest and research on Antarctic krill started in the early twentieth century driven by the intense whaling activity in Antarctic waters. A prerequisite for estimating distribution and movement of baleen whales was to understand the distribution and movement of their food, the krill. During the 1950s, the whaling industry in the Southern Ocean collapsed and hence the demand in krill research. The beginning of the 1970s saw a revival of marine Antarctic research. By that time, many traditional whaling grounds were either fully or over-exploited so that an alternative unexploited and freely accessible marine resources of high biomass and productivity had to be found. At this time, a significant commercial krill fishery started, and ever since this fishery has been the largest in the Southern Ocean in terms of tonnage caught. In the 1980s, the research focus shifted towards a better understanding of krill in relation to its environment and more recently towards physiological studies on how physical and biological factors influence the krill life cycle. A number of studies related krill abundances with winter sea-ice duration in the SW Atlantic, and inferred that the overwintering of krill, especially their larval stages, might be the critical bottleneck in krill population dynamics. Long-term data of krill abundance showed a decreasing trend with declining winter sea ice extension and duration1. While these correlation studies indicated changing trends in the ecosystem, they provided no real explanation and mechanism as to why, in this particular case, winter sea ice duration seems to be a critical factor in the population dynamics of krill. A long lasting paradigm is that the very patchy phytoplankton biomass in winter sea ice is an important feeding ground to promote and guaranty a successful larval krill development during the winter period. However, growth rate data from overwintering larvae from different regions of the Southern Ocean contradict this view. In our paper published in Nature Ecology and Evolution, we shed new light on the relationship between winter sea ice and overwintering larval krill. Given the tight coupling of climate and sea ice processes, and the importance of krill in the Southern Ocean ecosystem, it is crucial to resolve the mechanisms of krill-ice interactions to predict the response of krill stocks to climate change. The logistical difficulties of working in winter pack ice in the Southern Ocean have so far precluded researchers from gaining a mechanistic understanding of these interactions. Our expedition was the fourth winter voyage to the pack ice zone to study the relationship between krill, sea ice and ocean processes and the first comprehensive approach to understand the behaviour and biology of larval krill in relation to under-ice habitat types. Two of the four winter expeditions so far were carried out on board the German research vessel (RV) and icebreaker Polarstern (Fig. 2). The first expedition took place in 2006, and included our first dive campaign to study larval krill overwintering in the Southern Ocean. 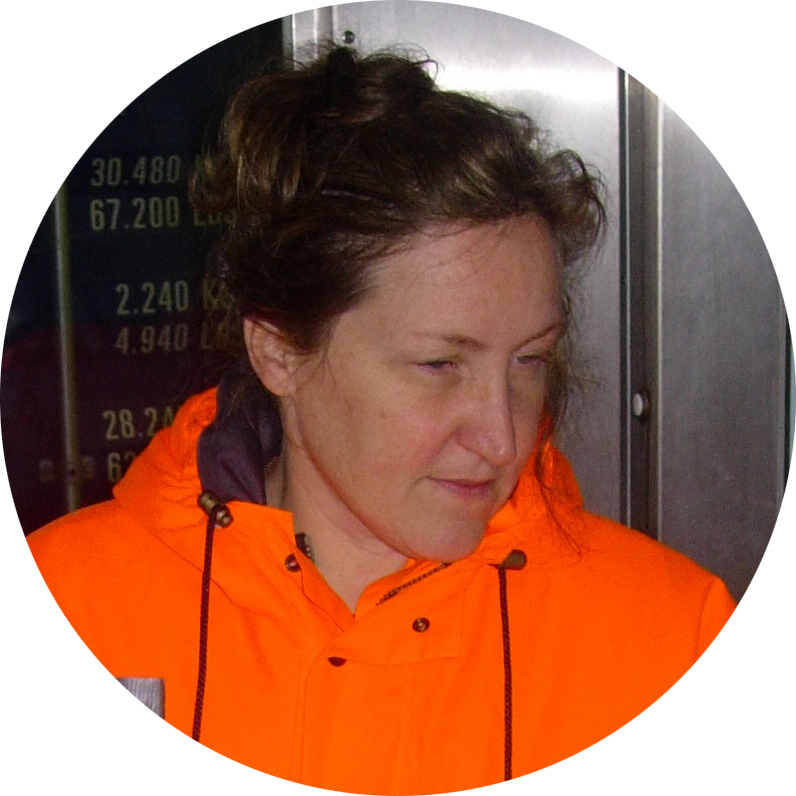 From the data and experience of the 2006 winter voyage2, a unique winter field study in the northern Weddell Sea was planned and we were able to carry it out it seven years later, in late austral winter 2013. Figure 2: Research icebreaker Polarstern during Expedition ANT29-7 in the pack ice zone, Photo credit: Jan van Franeker. A team of international experts on krill biology, the pelagic Antarctic environment and sea ice took part in this unprecedented scientific effort on board RV Polarstern. An international dive team (Fig. 3ba,) provided us with larval krill in pristine conditions to perform our process studies in the shipboard laboratories. They also provided us with video observations of krill larvae in association with sea ice (Fig. 4), and of their behaviour both during the day and at night as well as valuable information of the habitat itself (e.g. under ice topography, colouration of sea ice, sea ice samples, and currents). 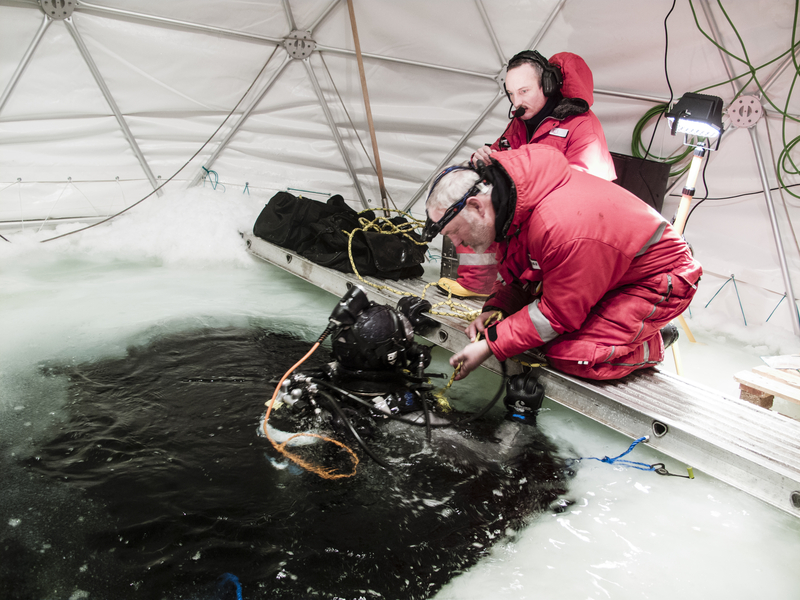 Figure 3a: Final checks in the Dome tent before an under-ice dive to sample krill, Photo credit: Noyan I. Yilmaz. 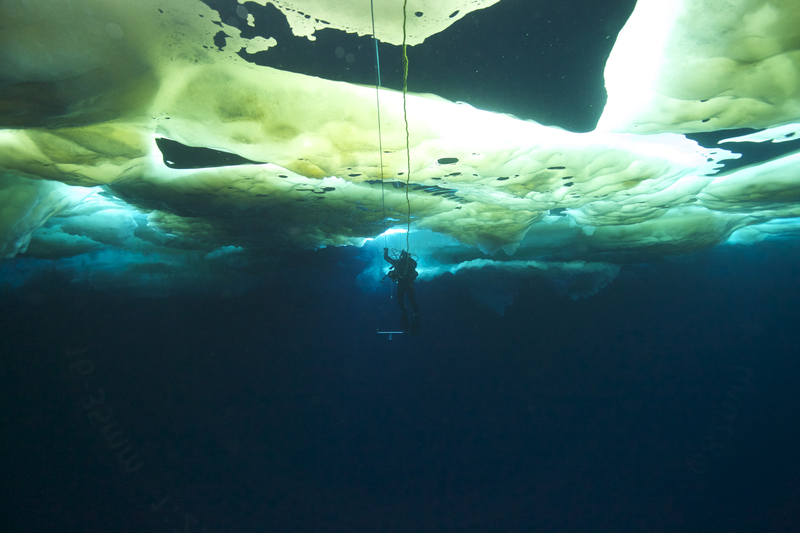 Figure 3b:Scientific diver under the pack ice during Expedition ANT29-7, Photo credit: Jérôme Maison. Figure 4: Larval krill under sea ice during Expedition ANT29-7, Photo credit: Ulrich Freier. All this information was essential to the interpretation of data generated from our process studies on larval krill on board. With this methodological set up and our knowledge from former overwintering studies we were able to get an understanding of the survival strategies of overwintering larvae and the role of the winter sea ice for their successful development and survival into austral spring. The dive team operated from rubber boats (Fig. 5) and ice camps (Fig. 6) and observed the behaviour of krill larvae over several days and up to two weeks day and night (Fig. 7). 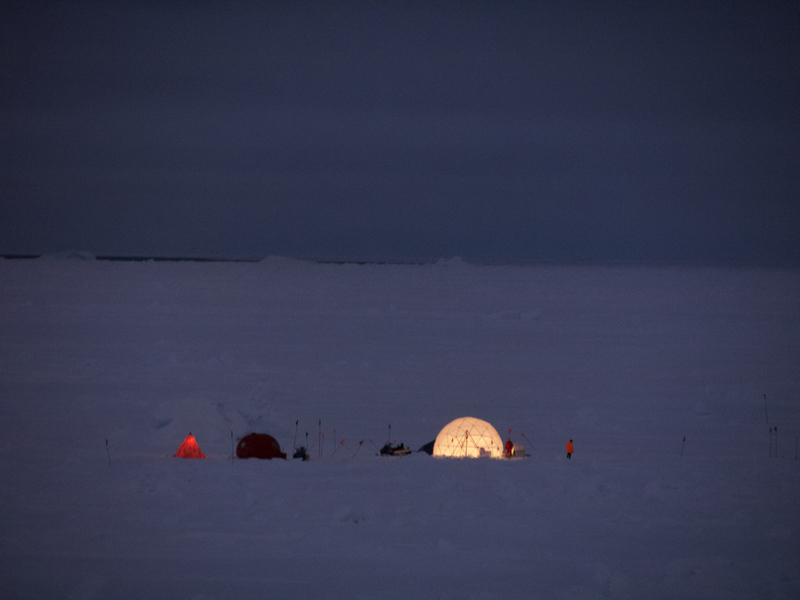 On the ice floe, the dive team used a “Dome tent” as a protection from the harsh weather conditions with strong winds and subzero temperatures (Fig. 3, left, Fig. 6). 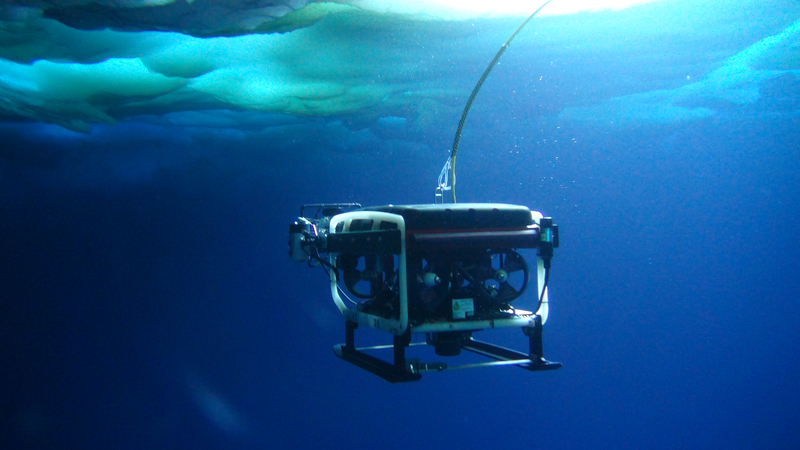 The dive operations were complemented with under ice observations using a Remotely Operated Vehicle (ROV, Fig. 8), equipped with different up-ward looking optical devices and sensors to investigate the spatial distribution of algal biomass within the sea ice3. 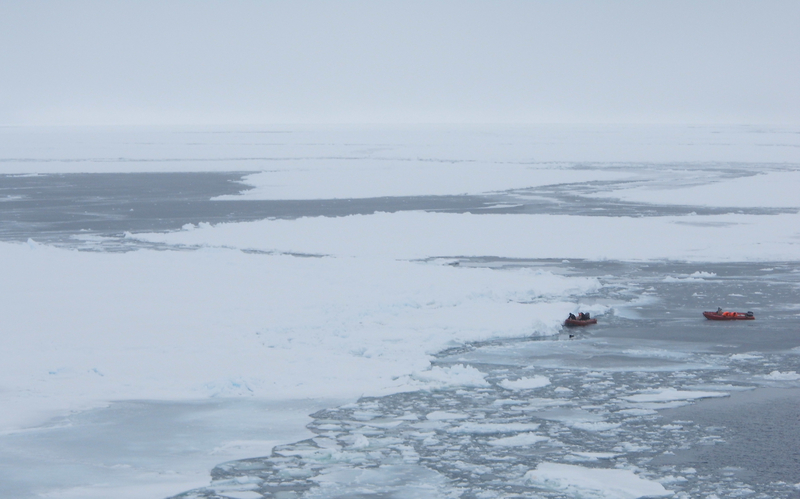 Figure 5: Dive operations from the rubber boat in the marginal ice zone during ANT29-7, Photo credit: Torsten Nitsch. Figure 6: Dive Camp II during the RV Polarstern Expedition ANT29-7. The white dome tent from which the diving team operated can be seen in the middle and to the right the tent from which the ROV was operated, photo credit: Jan van Franeker. Combined, the results of our multi analytical approach demonstrated that the pack ice zone is a food-poor habitat that allows larvae to only maintain a slight positive metabolic balance with slow growth rates. Our underwater observations suggest that algal biomass in the sea ice is not readily accessible to larval krill and has to be released into the water by physical forcing and/or melting processes before larvae can access it. As a consequence sea-ice is more important as a refuge against predation during the winter period, when food availability is low, and by serving as a drifting platform, which transports larvae into the productive marginal ice zone of the Weddell-Scotia confluence where growth at the end of winter is highly enhanced by water column productivity. Figure 7: Night dive operations at Dive Camp II, Photo credit: Jörg Göttlicher. Figure 8: Instrumented Remotely Operated Vehicle (ROV) under pack ice during Expedition ANT29-7, Photo credit: Ulrich Freier. This winter process study in combination with a new bio-energetic model, capturing krill’ ontogenetic development also recently published in Nature Ecology & Evolution4 suggest that the autumn and spring season represent the bottleneck for krill recruitment and not the winter seasons as previously thought. The model indicates, in remarkable agreement with field data, that the observed 5 to 6 years cycle with up to tenfold variation in krill stocks is caused by food competition between larvae and adult krill in autumn. The model further shows that the stability of the krill cycle and hence the ecosystem that relies on krill depends crucially on the net-difference between krill reproduction and consumption with far-reaching implications for the whole food web in the Southern ocean. During our expedition, the documentary “Licence to krill” was produced by David Sington, which was awarded the “Best Science & Nature Program at the Jackson Hole Wildlife Film Festival - JHWFF (Jackson Hole, WY, USA) in 2015. 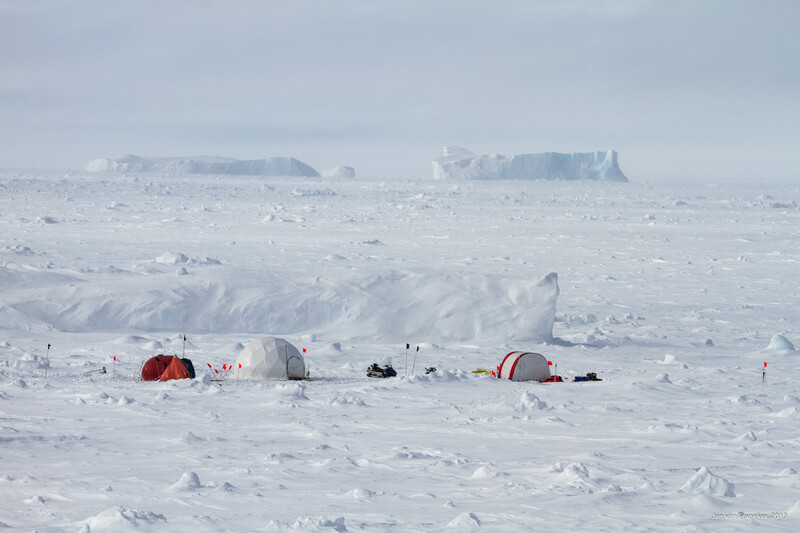 It gives a fantastic overview of the research we performed on the expedition in Antarctic winter. 1. Atkinson, A., Siegel, V., Pakhomov, E. & Rothery, P. Long-term decline in krill stock and increase in salps within the Southern Ocean. Nature 432, 100-103 (2004). 3. Meiners, K.M., Arndt, S., Bestley, S., Krumpen, T., Rocker, R., Milnes, M., Newbery, K., Freier, U., Jarman, S., King, R., Proud, R., Kawaguchi, S., Meyer, B. Antarctic pack ice algal distribution: Floe-scale spatial variability and predictability from physical parameters. Geophys. Res. Lett., 44, doi:10.1002/2017GL074346 (2017). Head of the winter expedition ANT 29-7 and the working group „Ecophysiology of pelagic key species at the Alfred Wegener Institute Helmholtz Centre of Polar – and Marine Research in the Biosciences Department (Section Polar Biological Oceanography), in Bremerhaven, Germany; Professor of Biodiversity and Biological Processes in Polar Seas at the Institute for Chemistry and Biology of the Marine Environment (ICBM) and PI in the Helmholtz Institute for Functional Marine Biodiversity (HIFMB) both located at the University of Oldenburg, Germany. Meso- and Makrozooplankton ecology, -ecophysiology, phenology, chronobiology of marine pelagic key species. 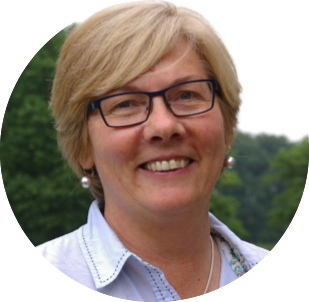 Sea ice Ecologist, Senior Research Scientist with the Australian Antarctic Division, Department of the Environment and Energy, Kingston, Tasmania, Australia; project leader with the Antarctic Climate and Ecosystems Cooperative Research Centre (ACE CRC), University of Tasmania, Hobart, Tasmania, Australia. 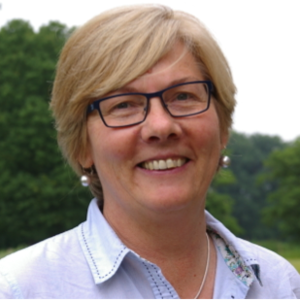 Biological Oceanographer, Senior Research Scientist in the Biosciences Division (section Polar Biological Oceanography) at the Alfred Wegener Institute Helmholtz Centre of Polar – and Marine Research, in Bremerhaven, Germany. Biological oceanography, Southern Ocean, plankton ecology, biogeochemistry. 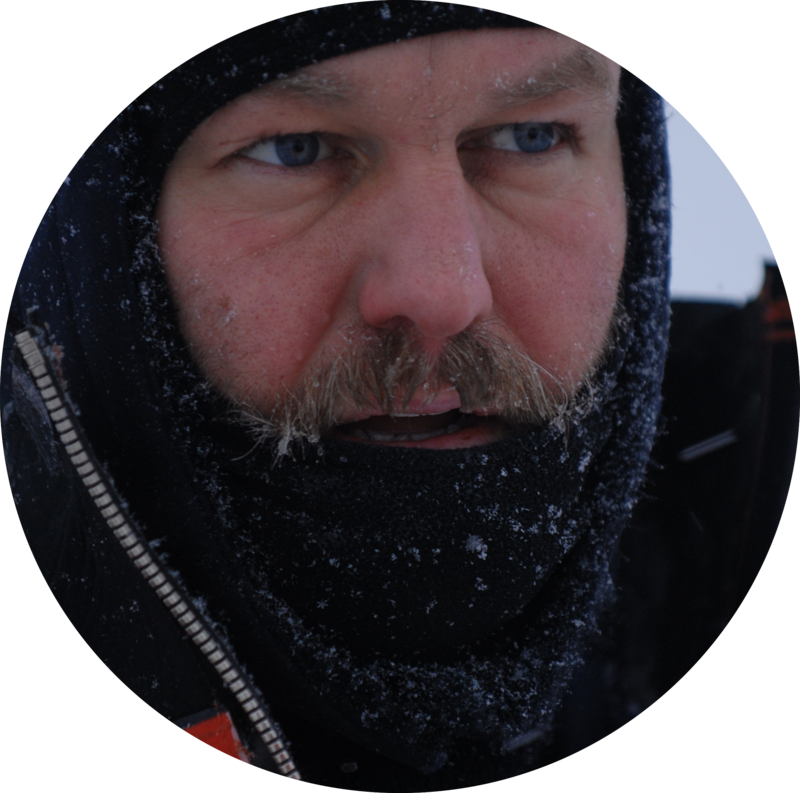 Molecular Biologist, Scientific diver and head of the dive team on the winter expedition ANT 29-7. 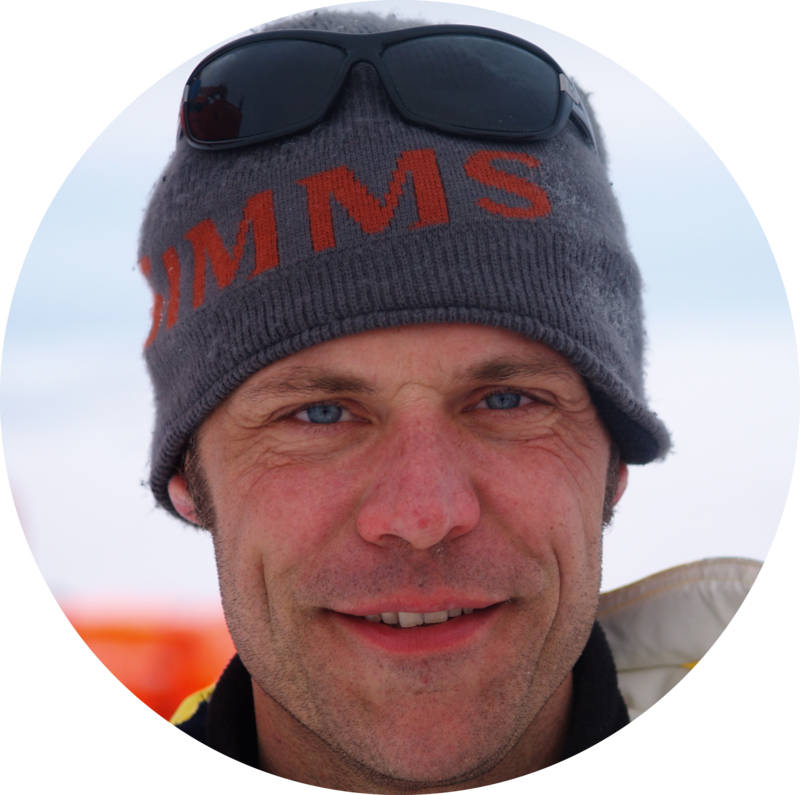 He is a freelancer, organising and leading dive operations in the Southern Ocean and providing technical scientific support of sampling devices to catch marine invertebrates in pristine conditions for experimental studies on-board research vessels.